The new version of iTunes is out! Apple has announced the availability of iTunes 9 at this years “It’s only rock and roll, but we like it” event in San Francisco which includes bunch of new exciting features. Also added is the much needed support for organizing apps for both iPhone and iPod touch. iTunes LP – Visual art from artists for song lyrics, liner notes, photos, and more. Home Sharing – iTunes makes it easier than ever before to share music, movies, TV shows, and more across your home network. The Redesigned iTunes Store – The new and improved designed iTunes Store makes it easier to navigate and find what you are looking for. iTunes Extras – Get extras when you buy movies from iTunes which includes, movie trailers, photos, interviews and more.. Genius Extras – Rediscover your forgotten favorites with Genius. iTunes can now automatically create a playlist for you from the songs that go well together! Improved Syncing – Includes easier and flexible syncing with support for organizing apps right from the comfort of your mouse. Windows 7 Jump List – iTunes 9 now supports Jump Lists feature in Windows 7. UPDATE 1: iTunes 9.0.1 is now available and can be downloaded from the link given below. UPDATE 2: iTunes 9.0.2 is now available for download. UPDATE 3: iTunes 9.0.3 is now available for download. UPDATE 4: iTunes 9.1 is here! Brings Support for iPad ! More info here. 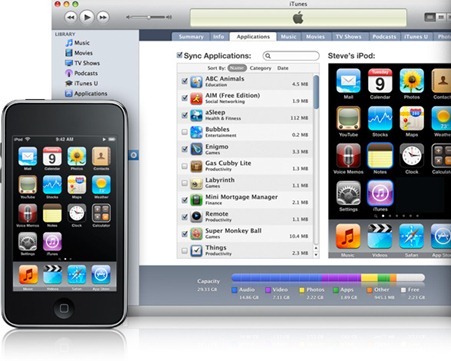 Check it again, Iphone 3GS 32GB 3.1.2 work well with Itune 9.1. But do not upgrade to 3.1.3. Because Itune will ask you restore and udate Iphone apter you update her. i have iphone 3gs version 3.1.3 and modem firmware 05.12.01 anyone knw it's possible to unlock. u can only jailbreak no hack yet for that version. so if u jailbreak it u can use it for an ipod for now. hi andrew, if ur iphone still in 3.1.2 firmware.. u can use http://blackra1n.com/ & follow the instruction. if ur iphone in 3.1.3 firware, u cant downgrade to 3.1.2… remember dont upgrade ur iphone to 3.1.3..
i was trying to update the software version of my i phone on 4.0 it was on 3.1.2 firmware after clicking restore from itunes it took some time n gave an error 1604. i have tried all the possible options to work around this error, can some help.now there is the itunes sign on my i phone. i have 2g and i very new on it, can anybody help me on which itunes will support to my phone, i hv download itunes 9 but it doesnt work. plz plz help me.